Spring is finally here and this mornings’ sun gave me the perfect opportunity to go out and take some pictures. Camera in hand I never really know what I’m after in a final image. I usually just let whatever happens, happen. Going with the flow as they say. Letting myself be drawn to colors and textures and feelings as I often do. In my own La La Land as most who know me would say. I love the spring flowers. They always seem to awaken my creativeness. The bright colors after a long bland winter are refreshing to the soul. I went about my normal inspection of the gardens and enjoying every moment of peace while it lasted. 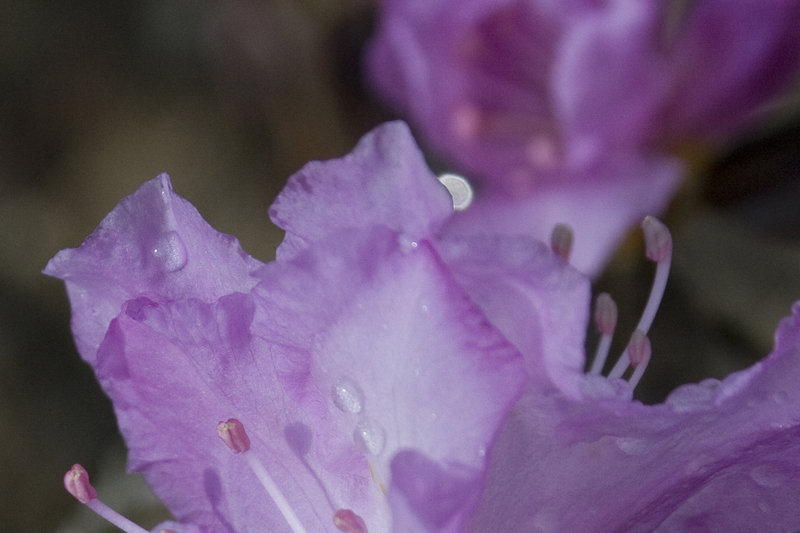 The Azaleas are beautiful with their light purple color and fragel petals. When they are in bloom I try to focus on them as much as possible since they are only around for maybe a week or less if we have an early morning frost. After inspecting the images I just took, these little beauties gave me a wonderous surprise. My first reaction when something like this happens is to check the camera inside and out for dust or water spots. You know….the normal things that would make an orb appear. Not finding anything there I took a deeper look. My camera wasn’t faceing the sun making a reflection. It was then that I found another strange happening. The orb moved behind the petal. If I looked at the sequince of images it moved not the camera. If it were a bug, taken as a macro shot, then it would have been in focus. So here is my delima….Is it an Orb as in a nature spirit? Or just a piece of dust? Dust outside? Pollen? Hummmm…..
I’m learning to believe that anything is possible and I won’t rule anything out at this time. As I go out in nature I keep this in the back of my mind and wonder in my world of La La Land…….Is there something more out there that I’m not seeing? Second Glances, An Introduction to Seeing is my first collection of these delightful, unexplained wonders. « Imagination, Inner Child and the Importance of Play. Don’t you love this mysterious, wondrous planet we all co-exist upon! So glad to have found your blog, Ann. Feels like I have stumbled upon an old friend!